On a first riffle through, this book has been mistitled, because all the customs that it describes are very much alive and kicking (literally in the case of Shrovetide football). Indeed a few, such as Hunting the Earl of Rone, Jack in the Green festivals, and cheese rolling at Stilton are essentially modern creations, only loosely based on the long dead customs they reckon to revive. No doubt this is because the title was devised to go with the author's earlier book - "Yesterday's Country Village" (2005). Buckton endeavours to cover the full range of English customs with 18 chapters: Hobby Horses, Hunting the Earl of Rone, Cheese Rolling, Shrovetide, Unusual Sports and Games, Mumming, Straw Bears, Wassailing, Flitch trials, Hocktide, Beating the Bounds, Tree Dressing, Jack in the Green, Rushbearing, Well Dressing, Fire Festivals, Bonfire Night, and Guy Fawkes Carnivals. An appendix lists 75 specific "featured customs". The descriptions of current customs tend to include detailed narratives of the relevant days' events, often with details of times, stopping points, etc. There a moderate number of photographs, mostly in black and white, but there are no suggestions for further reading, nor is there an index. All the chapter headings seem to be generic, but a couple are deceptive. For instance, "Flitch Trials" really only means the unique "Dunmow Flitch", and "Hocktide" similarly only means Hungerford's "Tutti Day". Conversely, some chapters wander away from their main theme to cover other customs. For instance, "Straw Bears" primarily concerns the well-known Whittlesey custom, but goes on to discuss Plough Monday, although only in the fenland counties. Similarly, "Tree Dressing" also includes Oak Apple Day and the Castleton Garland. The chapter on "Mumming", largely draws on material provided by Tom Hughes, education office for Chester Museum, and a member of the Jone's Ale Soul Cakers, who is evidently well informed. Cheshire plays consequently account for more than half of the chapter, although the descriptions and historical summary are nationally applicable, if one allows for local variations in characters and collective names. The focus is on the Hero-Combat plays, although he does mention the other forms of Quack Doctor play and the Derby Tup plays. He also includes a brief description of Mystery Plays, by way of contrast. Possibly the unique selling point of the book is that it tells the stories of the origins of the customs from the points of view of the participants. Having gained this general impression from an initial quick dip in, I am pleased to see that it basically in line with the view of Folklore Society president Robert McDowell in his Foreword to the book. It is important to bear in mind that these stories may or may not be backed up by historical fact, so they need to be treated with caution. Some information is indeed based on established facts, but some views are outdated or lapse into fanciful Celtic and pagan imagery, as in the chapter on "Fire Festivals". Buckton does not comment on these either way, possibly out of deference to his informants. As there are no references and there is a notable dearth of acknowledgements to folklore academics and experts, one wonders how much background reading he has done. 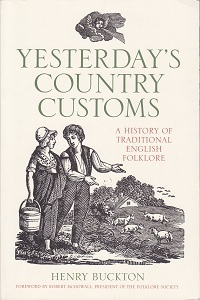 Nonetheless, Buckton's book is a useful snapshot of English customs as they exist today.